How could I be so forgetful, as to not make a quick update about the latest project I am working on. As a designer I have had to call upon the help of professional programmers to get this idea of the ground. 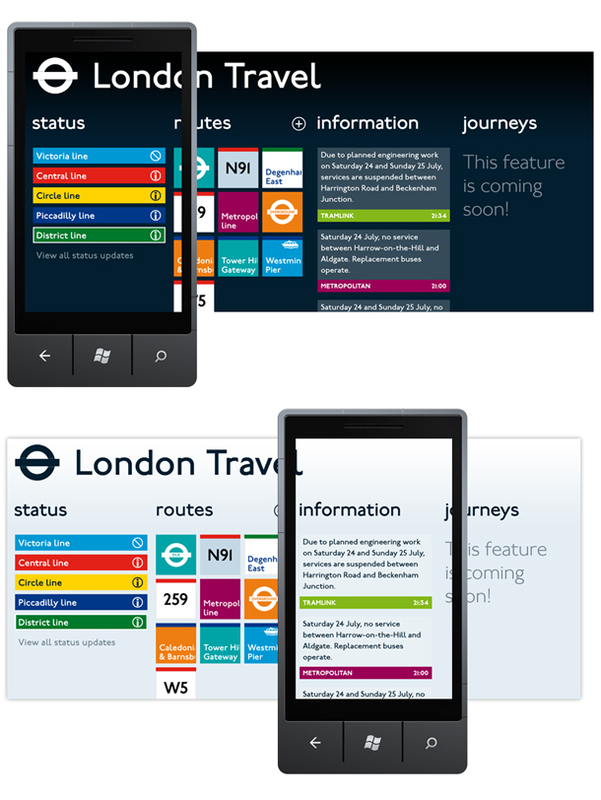 Anyway, here is my idea for a Windows Phone 7 App, London Travel. Taking advantage of the Panoramic UI, and the fact that the Windows Phone design is based on transport signage and information design, what is better than a Transport Service and Information app to really get the most out of the UI. So far, I have taken those mock ups and have really polished them, and slowly I am getting to grips with the development tools and platform, to create (and sometimes code up) the various pieces that will be needed for the app. I have a volunteer on board who is coding up the data and web components that are at the heart of this app, but am still looking for people with Silverlight and C# experience who could help me ensure the various controls and code I am working on will work well, and make sure I don’t screw everything up. If anyone is out there, willing to help us out, please do get in touch via email or twitter and if the app is a success, you will be listed on the credits/about page, with a link to your twitter or website, and if we are done before october, we may even be a launch day release! I found it important to give myself an understanding of some of the aspects that goes into programming, for whatever platform you take an interest in. While you get a basic understanding, on whats possible, you still wont know enough to build a significant app, so thats when you start frequenting forums for developers on that platform, be it iOS, Android, Windows Phone, Mac, Linux or Windows proper, and start talking to the developers there. Then you should come up with an idea of an app you would like to build, and as any designer knows, you need to pitch it to people who have the skills you lack, and get them to be excited in your vision, and then you should be able to form a team to work with. Yes I made sure to discuss my plans with them before significant work had taken place, and we got back a checklist of things to change and things to keep in mind. I am confident we wont be getting any legal complaints for them, when they start sending their lawyers after those infringing their IP and breaking the rules set out for developers! looking forward to this app, it looks amazing. I would like to make an app aswell. im a graphic designer but i have no coding skills, i need help. how would i go about finding people to help me build an app. Have you got TfL’s permission to create this app, they stopped me making my iPhone app about London Travel. The design for the app looks great. 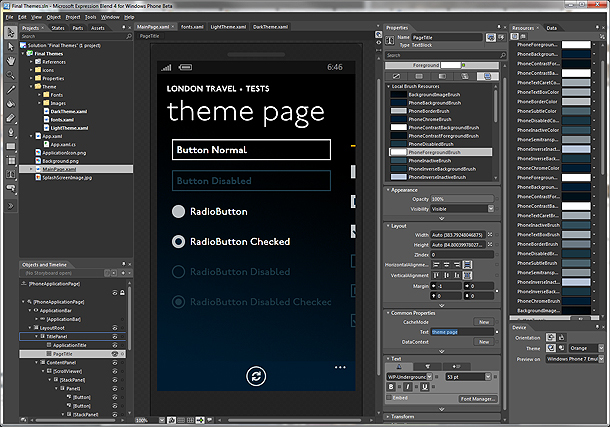 Im coming to completion of my app which does the same thing, although Im a developer with limited design skills. If you ever want a chat about anything related to this then feel free to contact me. This is just a quick update. I have two guys who are working with me on this project, and it is going quite well. Soon I will be preparing a YouTube video showing off the beta. Also Martin Beeby of Microsoft has been very supportive so I would like to thank him for all that he is doing to help us get this app finished and up on the Windows Phone marketplace!